Take a look at all of our adoptable bunnies! 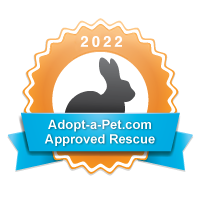 You can also find a list of our bunnies on Petfinder or on Adopt-A-Pet. If you are considering adopting from Ohio House Rabbit Rescue, please review our Adoption Policy. If you have read our Adoption Policy and want to adopt one of OHRR’s rabbits, please complete and submit the online Adoption Application. You can meet many of our bunnies at the Ohio House Rabbit Adoption Center during open hours (Wednesday 5:30 – 7:30 pm and Saturday/Sunday 12-4 pm). If those times do not work for you, please send an email to contact@ohiohouserabbitrescue.org to schedule an appointment. If you are considering adopting from Ohio House Rabbit Rescue, please review our Adoption Policy. If you have read our Adoption Policy and want to adopt one of OHRR’s rabbits, please complete and submit the online Adoption Application.